I received my email, yes. I gave up on WebOS earlier this spring when I saw no indication that Sprint would get a WebOS device. $50 isn’t worth it for a Sprint user who’s been on a Pre Minus for two years. $150, maybe. It’s about the cost of a subsidized phone for the last two years. I love WebOS, truly. Elegant design, still IMO the superior OS for smartphone/tablet technology. I hate how HP has piddled on customers the last year. Q4 2010, “We announce the Pre 2!” Plus sales drop to zero for two quarters before the Pre 2 is even available. And before the Pre 2 is available… they announce the Pre 3. This, after publicly stating they’d never crucify a product release like they did in Q4 ’10, ever again. I’m on Android tech right now. It’s good. Not WebOS fabulous, but slick in its own way, and hey, there’s a robust market for devices and apps. I was a WebOS believer. Now, I’m a disappointed agnostic. 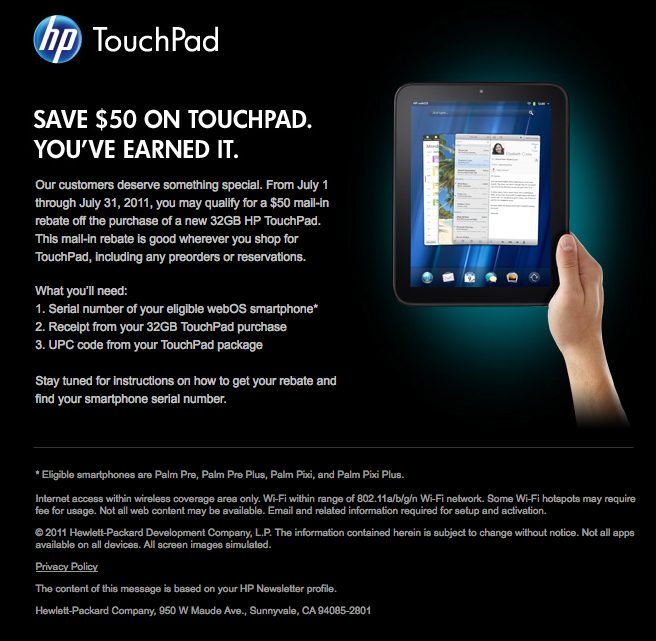 HP’s going to have to do far more than toss around a $50 coupon on an untested device to get me interested again. Yeah, that just about sums it up for me, too. I loved my Pre, but Palm goofed in not getting Sprint to pick up the Pre Plus, or Pre 2. The Veer would be a great phone if it wasn’t on AT&T’s (crappy) network. There’s no reason they couldn’t do a Veer on CDMA. I’d love to see a Pre 3 on Sprint. Who knows if Sprint will offer it or not, though.